Experience the incredible speed of the London Stansted Express as you cover the distance in just 47 minutes. By road, the journey is 53 kilometers and usually takes little over an hour to traverse. During certain hours, due to the large amount of road traffic in and near London, it can take longer than an hour. The train, however, will always require just 47 minutes to travel between the two locations. With trains available very frequently, there is a good chance that you will find a train in the next 10 minutes, regardless of the time you reach the station. On certain days of the week, such as Mondays, Fridays, and Saturdays, you can take a train as early as 3:40 AM to catch the early flight. The train will stop only once, at Tottenham Hale. 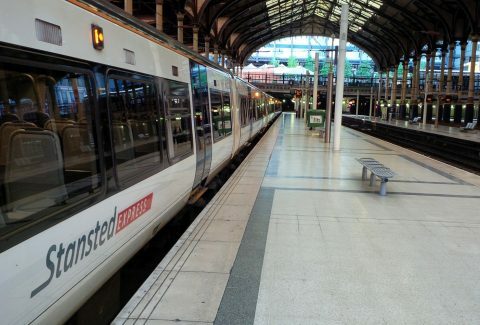 Since Tottenham Hale station opens only at 5:20 AM during the weekdays, you will have to travel up to Liverpool Street to catch the train to Stansted. With abundant space, you can take a laid-back ride, while also having enough place to keep your luggage safe and within eyeshot. The First Class compartment interiors are quite grand, and there are significantly fewer people traveling on this. During the rush-hours, you might find that it is worth buying these higher-priced tickets. You can also avail a complimentary cup of tea or coffee, along with a newspaper, before you board the train. Monday and Friday only - 3:40 AM, 4:10 AM. Monday to Friday - 4:40 AM, 5:10 AM, 5:25 AM, 5:40 AM, 5:55 AM. every 15 minutes until 4:25 PM, 4:39 PM, every 15 minutes until 7:09 PM, 7:25 PM, every 15 minutes until 10:55 PM, 11:25 PM. Saturdays - 3:40 AM, 4:10 AM, 4:40 AM, 5:10 AM, 5:25 AM, 5:40 AM, 5:55 AM. every 15 minutes until 10:55 PM, 11:25 PM. Sundays - 4:10 AM, 4:40 AM, 5:10 AM, 5:40 AM, 6:10 AM, 6:25 AM, 6:40 AM, 6:55 AM, every 15 minutes until 10:55 PM, 11:25 PM. You will receive an email confirmation with your London Stansted Express: Train to/from Central London ticket voucher shortly. Please take a printout. Show the printout with a valid photo ID. By Bus: Get off at Liverpool Street Station using buses 8, 26, 35, 42, 47, 48, 78, 135, 149, 205, 242, 344, 388, L1, L2, L3, N8, N26, N205. By Subway: Get off at Liverpool Street using lines Central, Circle, Hammersmith & City and Metropolitan.